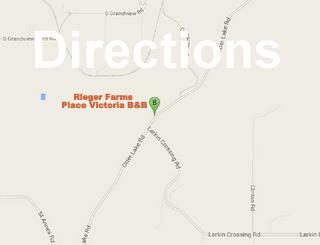 Place Victoria B&B Inn is nestled in a park like setting on Rieger Farms on a 54 acre country retreat. 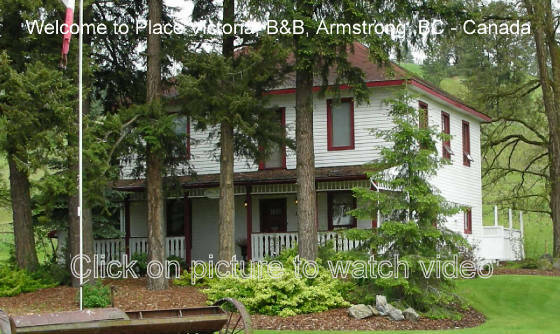 Place Victoria B&B, one of the first established Bed & Breakfast in the Armstrong area in British Columbia, Canada, located between the City Armstrong and the City of Vernon. Place Victoria B&B Inn has beautiful restored Heritage homes, built in 1886 and 1892, providing you a pleasant stay. The Blacksmith house built in 1886 and renovated in 1995 offers our guests privacy. Rooms in the Blacksmith house feature private entrance, private bathroom, fridge and satellite TV. For your comfort, Place Victoria B&B Inn is a non smoking facility. Rooms offer private entrance and private bathroom. A gourmet breakfast is included in B&B rates. 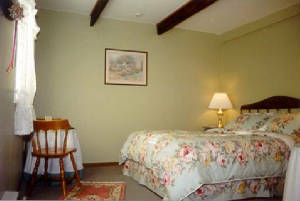 Place Victoria B&B Inn is almost halfway between Vancouver,BC and Calgary Alberta, an ideal stopover for travelers. The closest airport is Kelowna International Airport which has flights from many North American cities is just 20 minutes away. Airport shuttles, buses or taxis can take you North through Vernon to Armstrong. 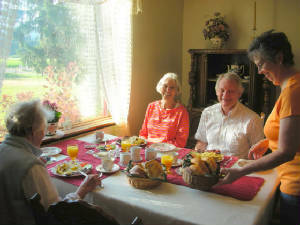 Place Victoria B&B will ensure you a fine tradition of European hospitality. We speak English, German and Badisch.